Some sweet friends of mine were married this summer. I was sad I couldn’t attend their wedding, so I knew I wanted to do something extra special for them in addition to a normal gift. I decided to finally try my hand at an embroidered portrait. I actually gifted the couple with the portrait at my own wedding because it was the only time I expected to see them this year. It felt tacky to me, but I was too excited not to share! The down side is I didn’t manage to take detailed photos of the finished project because I was too busy doing other wedding-related things. Her dress and his tie are painted with watered-down watercolor paints. I didn’t paint right to the edge because I worried the paint would bleed. It was fun to watch as the paint moved outward from the area I’d painted. The buttons on his vest and jacket sleeve are real, miniature buttons! They were left over “eyes” from Christmas ornaments shown here and here. I chose a rose fabric for the background to imitate the actual background of their engagement photo. I used an iron-on stabilizer behind all but the background fabric to reduce fraying. I actually used two layers behind the cream-colored fabric so the other fabrics wouldn’t show through as much. It was a lot of fun to make, and I’m thrilled it went as well as it did. As always, I learned a few things I’d do differently next time… if there is a next time! I worried the portrait could be received poorly, especially if my poor art skills meant one of the two looked deformed when I was finished; the final few stitches can ruin hours of work. I’m happy with this portrait, but I’m not sure I’d put myself through the mental anguish again! 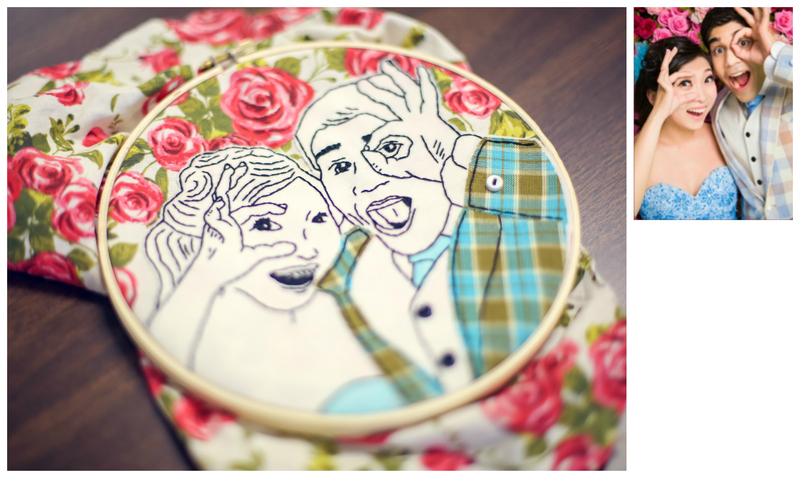 Categories: Embroidery | Tags: embroider, embroidered portrait, embroidery, engagement photo, engagement portrait, heather ross portrait, lucky jackson, modern embroidery, personalized portrait, personalized wedding portrait, rifle paper co portrait, watercolor, wedding portrait | Permalink.